Disaster struck during our last trip. 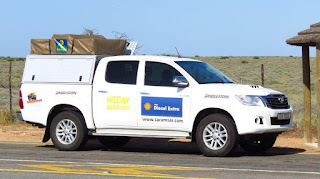 After visiting the Orange River Mouth near Alexander Bay in South Africa and Oranjemund in Namibia, we were on our way to visit the remaining Ramsar wetlands in KwaZulu-Natal as well as Lesotho. We stayed over one night in Pretoria when our journey came to an abrupt end. Our vehicle with all our camping equipment, food, drinks, cameras, binoculars, passports, personal documents etc were stolen on the morning of 7 November 2015. This is the reality of organised crime in Southern Africa. Years of planning, preparation, and procuring of items for this project were gone in an instant. We had no choice but to return to Cape Town to regroup and start over again. Although it is painful with a lot of hatred and revenge ideas, we will not that this incident affect our project in a negative way. It will take a while, but we hope to continue early in 2016 and complete our visits to the last Ramsar wetlands in South Africa. After that we will move onto the Ramsar wetlands in neighboring countries. This is a picture of the stolen vehicle shortly before the incident.